Thoughts on my blog today after the road I traveled in an innovation experience, in a second grade class where I subbed. Today each grade level spent a class period in an outdoor Innovation activity. Today was the day they were making a Rube Goldberg Machine First I have to say the energy and excitement was palpable. Given all that, their ability to stay focused and create their “slide” was incredible. This is Green Week at the school and part of the focus for the innovation time was the idea behind Recycle, Reuse and Reduce. I left school today wondering where would I go with this experince if this were my class? What would I want the students to come away with? The play, the collaboration, the trail and error and the creativity in and of itself made this a valuable experience. But as I reflect, I know what I would like to see happen. What worked and how did you decide how to use the materials? Did you understand how this was related to GREEN Week? Why did they not have tape (the idea of reuse)? 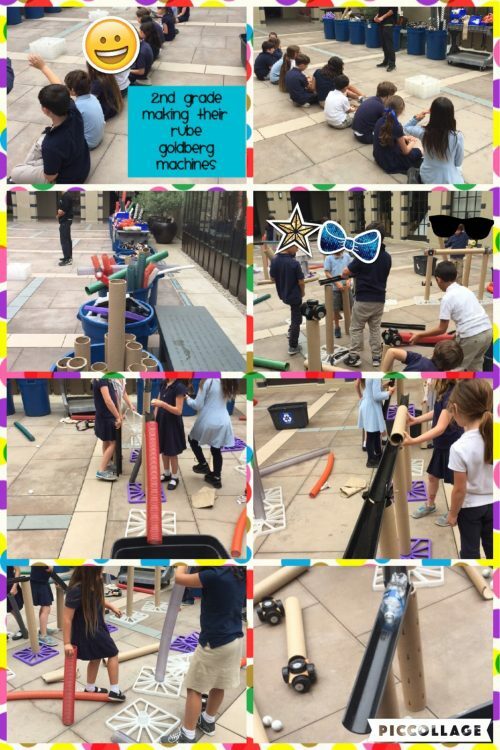 Now for me I would ask: Can this Rube Goldberg activity inspire students to think beyond the joy of their accomplishment (whether successful or not) . Can we develop this into a geniushour experience? Can we brainstorm with the class how this might lead to environmental changes or help people in different communities? Can we extend the learning beyond this one time activity? Can this lead to broader considerations of innovation as a foothold into questions, research, experimenting with ideas and more questions. How have activities set your mind a whirl trying to see what can be done to extend the learning? This entry was posted in Uncategorized and tagged #geniushour, @wonderoplois, @wonderopolis, Innovation, subbing. Bookmark the permalink.